For more than 4,000 years, cacao—better known as cocoa—has been beloved by humans. It is thought to have first been cultivated in Central and South America, where it grew wild in forests. The Aztecs turned the seeds and pulp from cacao’s large, fleshy pods into a drink called chocolatl, which Spanish conquistadors brought to Europe in the 1500s, kicking off an enduring chocolate love affair among Europeans, and later Americans. The chocolate business, of course, has grown far beyond its wild New World origins, generating more than $100 billion in 2017. Despite the massive size of the industry, most cocoa is produced on small farms in West Africa, primarily in Ghana and Ivory Coast, where growers tend to a few acres lined with rows of cocoa trees growing in full, equatorial sunlight. It has become increasingly apparent though, that this way of growing cocoa isn’t sustainable. Current farming methods despoil land and require ever more resources to produce the same crop yields. Pretty much the entire cocoa industry agrees that farmers need to radically change their approach, the sooner the better. Luckily for chocolate lovers, there’s a possible solution that’s as old as cocoa itself. Ethan Budiansky, director of environment for the World Cocoa Foundation, a nonprofit group promoting sustainable cocoa among its 104 members from the cocoa industry, explains that growing cocoa in full sun requires “highly intensive” use of fertilizer, pesticides, and water. And “over time cocoa becomes less and less productive,” he says, noting the trees’ yields drop off more quickly when grown in full sunlight. “In order for farmers to make ends meet, they're often required to expand their farms into other regions, which would mean they're moving into the forested areas.” This expansion contributes to deforestation and climate change. According to Budiansky, the current full-sun, monocrop model of cocoa-growing “is actually an evolution from the way cocoa used to be produced, which was much more within the forest under the shade of [other] trees. That's what we're really trying to move back toward.” This concept, called agroforestry, calls for crops like cocoa to embrace their shade-loving origins and be planted under other trees, either naturally regenerating trees already in the forest or faster-growing tree crops planted alongside cocoa. Budiansky says that cocoa trees grow best in partial shade and will produce for about 40 years, as opposed to full-sun cocoa’s 25-year production maximum. The soil quality is also enhanced and the shade helps maintain the optimal temperature and moisture level for cocoa, even as the planet warms. Climate change is a major concern for the cocoa industry. A 2011 study by the International Center for Tropical Agriculture predicted that if climate change continued unabated, by 2030 the areas suitable for growing cocoa would begin to shrink, particularly in West Africa where high-altitude sites with appropriate climates are hard to find. By 2050, close to 90 percent of land in Ghana and Ivory Coast’s growing regions would be “dramatically impacted,” according to the study. Of the areas that might develop more suitable climates for cocoa trees by becoming a few degrees warmer, many were located in forests already protected from further agriculture. “This [report] was really a wake-up call to the private sector to say something has to be done,” says Budiansky. Chocolate purveyors aren’t just worried about the quantity of cocoa available in the future; they’re also worried about how shifting climate conditions could impact the taste of their products. “Environmental factors like longer dry seasons or different air temperature impacting fermentation and drying will all impact flavor, ” Amy Guittard, marketing director at the family-run Guittard Chocolate Company, wrote in an email. 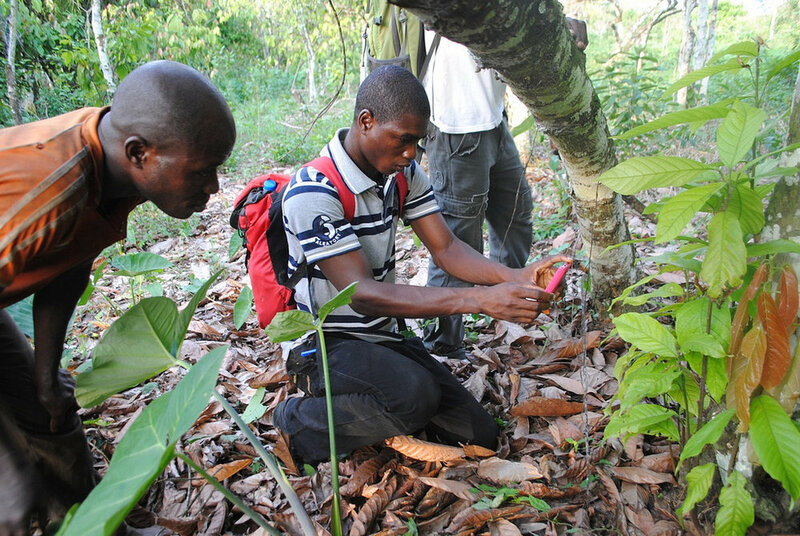 Farmers on a cocoa farm incorporating agroforestry principals. Photo courtesy of the World Cocoa Foundation. As chocolate companies have begun to work with environmental groups like the World Cocoa Foundation (which has more than 100 members, including most global chocolate brands) and Rainforest Alliance (which certifies sustainably grown cocoa) to tackle climate change’s threat to their industry, they homed in on one cause they could do something about: deforestation. Clear-cutting forest is a problem for many agricultural sectors, and as Budiansky notes, cocoa is not immune. According to The Climate Institute, the kind of small-scale farming practiced by most West African cocoa farmers is among the main causes of deforestation around the world. A 2014 article in Sustainable Science also named cocoa as a “major driver of deforestation” in West Africa, particularly Ivory Coast. The authors wrote that historically, farmers were attracted to the fertile soil, and low incidence of pests and disease, found on recently cleared forest land. However, as you may recall from an elementary school science lesson, trees capture carbon dioxide, so by losing them you lose one of the most reliable greenhouse gas-fighters on Earth. And if you lose them to fire—such as with slash-and-burn agriculture—all that stored CO2 is released into the atmosphere in a matter of hours. The Climate Institute estimates deforestation contributes to 25 percent of greenhouse gas emissions. While industrial agriculture and logging operations, rather than small farmers, are the biggest drivers of deforestation, governments and chocolate companies seem to have realized that clearing forests is at best a short-term solution to the problem of declining yields among full-sun cocoa crops. 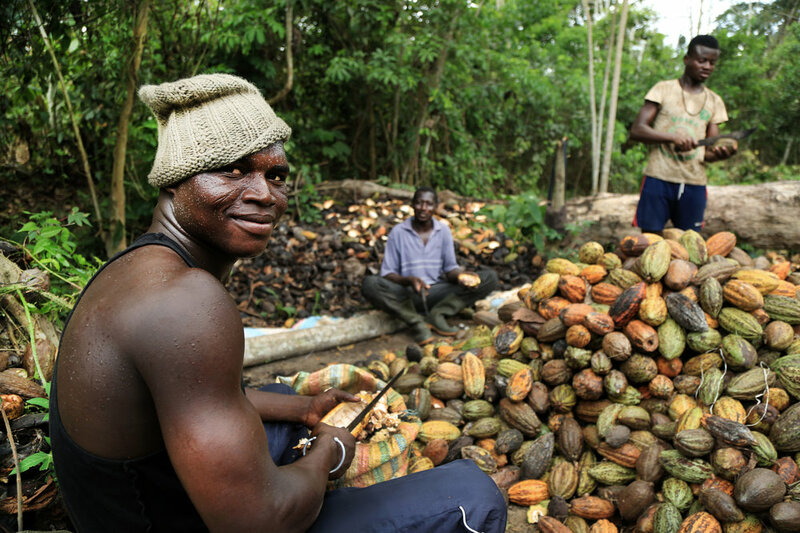 The governments of Ghana and Ivory Coast have both pledged that as of Jan. 1, 2018, no more forest areas will be converted for cocoa production. And under the auspices of the World Cocoa Foundation, companies have promised to end deforestation in the cocoa supply chain as well. In fact, what the cocoa industry wants to do is plant even more trees, turning farmers’ small plots into micro-forests of different tree crops grown together in a manner similar to their original ecosystem. The World Cocoa Foundation and its members predict that not only will agroforestry substantially cut down on cocoa farmers’ need for new land, it will help restore old farmland and protect existing forests. 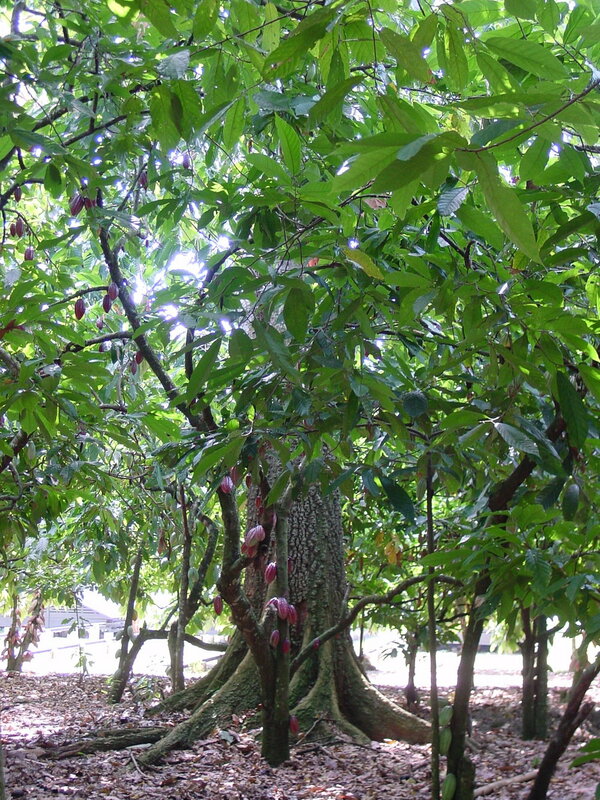 Cocoa tree growing under the shade of a larger tree. Photo courtesy the World Cocoa Foundation. Additionally, the shade trees can be harvested, providing another income stream to farmers and helping to offset poor cocoa yields that may otherwise encourage farmers to expand into forested areas. For the long term, timber trees like teak hold such promise that the World Cocoa Foundation is working to promote laws in Ghana and Ivory Coast to allow farmers to own those trees outright. (Previously, timber trees were considered property of the government.) Fruit-bearing trees like mango or plantain grow more quickly, giving farmers a secondary crop to sell as young, shade-grown cocoa trees become established. Budiansky is particularly excited about Moringa’s use as a shade tree. Moringa is a hardy tree native to India that can withstand high heat and needs little water to flourish. It’s become known for its vitamin- and mineral-packed leaves and seeds, and the tree also has biofuel and water purification uses. Hershey’s, which has promised to source all its cocoa sustainably by 2020 (King says they’re already at 75 percent), has made agroforestry a key part of its $500 million “Cocoa for Good” initiative. Guittard, which has been certified by the Rainforest Alliance since 2011, uses its “flavor labs” in Ghana, Ivory Coast, and Indonesia (the third-largest producer of cocoa in the world) to promote agroforestry. 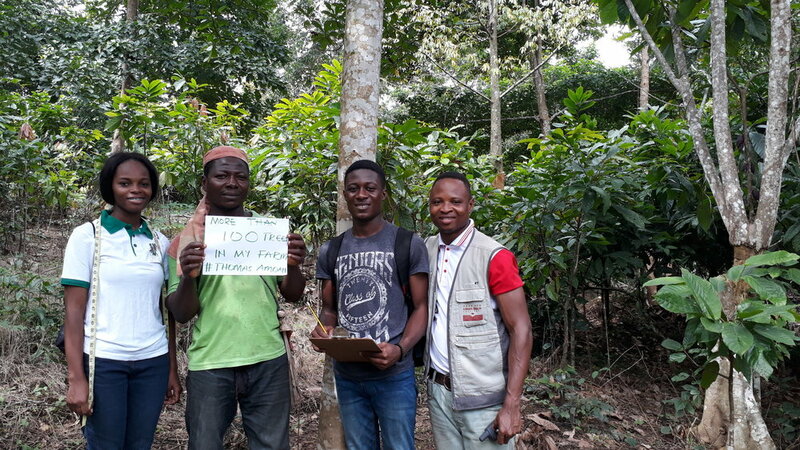 But for all the cocoa industry enthusiasm, the vast majority of these companies don’t own the farms they source from, so they must work with individual farmers to educate and train them in agroforestry, and monitor suppliers to ensure compliance. “As a chocolate maker, you can’t do anything without first having close relationships throughout your supply chain,” says Guittard, who is particularly concerned that any new techniques introduced maintain the flavor components unique to each region. And for those farmers, investing in brand-new crops is a major commitment. “There is a trade-off with production,” admits Budiansky. “Full-sun cocoa, especially if you're adding chemicals and fertilizer, will get you the highest level of productivity in the short term. When you start incorporating agroforestry species, you are decreasing the overall productivity of your farm. However, that farm is going to be there for a longer period of time and you'll have more sustained productivity,” he says. Most obviously, growing trees takes time. Teak and other hardwood timber trees may take 25 years until it can be commercially harvested. A mango tree takes five to eight years to fruit from seedling. Plantains take just a year or two, but after the fruit is harvested, the tree is cut down and a new one takes its place. Some companies, like Hershey’s, are exploring financing arrangements to help encourage farmers to make this long-term investment. Another practical concern is that cocoa farmers already know how to grow cocoa; they may not know, or care to learn about, new crops. “When you start making a system more complex, it's also more labor intensive,” says Budiansky. “Because when you start growing cocoa with other species, they're going to compete for the same resources. If a shade tree is producing too much shade, that's not good.” Farmers need to consider how best to prune, harvest, and care for these new tree species as well. Still, the World Cocoa Foundation reports that some cocoa farmers incorporating agroforestry and other “climate-smart” practices can eventually double their yields, in addition to diversifying their income with other crops. Increasing trees grown, as opposed to clear-cutting forest, also has a fairly immediate impact on the surrounding environment. Callie is Make Change's editor in chief.